What you really need to know about “cheap” newborn photographers … and how to avoid the risks. Today, nearly everyone has access to a decent camera on their smart phones. And, for a relatively small price, anyone can buy a digital camera. This access to modern camera technology is great! However, there is a potentially dangerous downside that’s especially relevant to new parents and parents-to-be. The danger is in the huge number of camera-wielding amateurs and inexperienced professionals who now offer newborn photography sessions. They slap up a website or Facebook page and lure new parents with low prices. Yet they often don’t have the skills, experience, equipment or knowledge to safely create newborn portraits. Making the problem even worse is that many low-price photographers DO NOT HAVE general liability insurance. Oftentimes, this is because they’re trying to win new clients by offering cheap prices … which means they can’t afford insurance. And they’re taking advantage of new parents who never think to ask about it. So even if the “cheap” photographer doesn’t do anything “overtly risky” during the photo session, if there’s any sort of incident or accident (like a falling piece of equipment, or someone tripping) the client will be left with the medical or legal expenses. I hope you can see the potential for the terrible (and completely avoidable) health and financial risks. … but the consequences of choosing your photographer based on price … and not asking about their training, experience and insurance coverage … could be devastating. … but the safety and welfare of your baby isn’t worth putting at risking just to save a few dollars. Also, a cheap photographer will typically be less skilled than an experienced professional. As a consequence, they’ll be less likely to consistently shoot high-quality images. Furthermore, they’ll probably have poorer retouching skills. This could mean you’ll get stuck with images you regret rather than enjoy. Newborn photos are a once-in-a-lifetime opportunity. They have the potential to invoke joy and happy reminiscence throughout your entire life … and the entire life of your child … and generations to come. To risk that immeasurable reward … not to mention the safety and financial risks … for the sake of saving a few dollars on a cheap photographer, is a choice that parents should carefully consider. For these reasons, I always recommend to new parents that they choose an experienced, professional newborn photographer … one who specializes in newborn photography. 1. Ask your potential newborn photographer to provide proof of their business registration and general liability insurance. And while you’re at it, ask them to show proof of their DTap vaccination and newborn safety certifications as further evidence of the priority they give to your baby’s safety. 2. Review the newborn photographer’s website or portfolio to make sure they specialize in newborn photography and their style appeals to you. Newborn photography is a highly specialized field that requires extensive training and experience. Even an experienced professional photographer that offers other types of photography (e.g. weddings, corporate, boudoir, events, etc.) may not have knowledge of newborn physiology and baby safety. 3. Discuss with your photographer what you will receive and when. Some photographers deliver images as digital files with little or no editing. Others will retouch every image, which will likely add to the quality but possibly also to the delivery time. 4. Make sure your professional newborn photographer offers the type of products you want. Maybe they offer only digital files? Or do they offer a range of prints, albums and wall art? 5. Insist that your professional newborn photographer provides you with a contract. It should describe all that is included in your newborn photo session, and your obligations in return. This will reduce the risk that you don’t receive all that you expect for your investment. The arrival of your new baby is an exciting and busy time. It’s natural to want to capture this time with beautiful newborn portraits and baby photographs. Your choice of a professional, experienced and trained newborn photographer is your best assurance that you will love the photo experience and the images you receive. Footnote: This should not discourage upcoming newborn photographers. To the contrary. 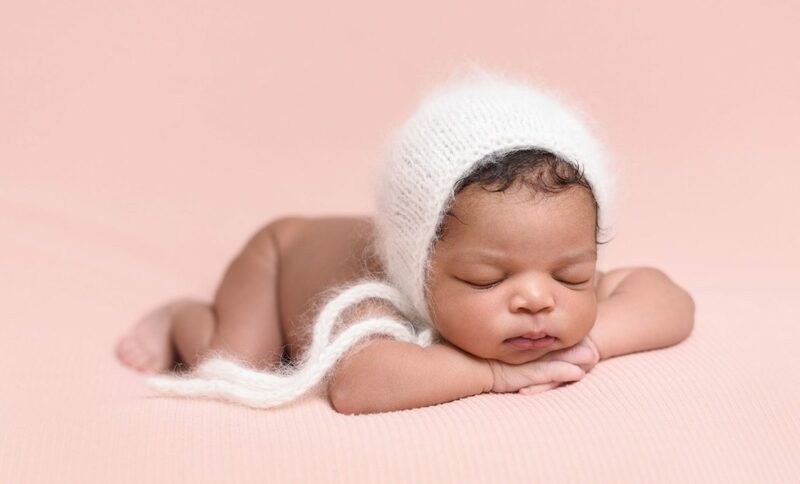 But newborn photographers should work with experienced mentors, study newborn physiology, invest in the right equipment and commit to the many necessary hours of training before they offer newborn photography services to the public. Interested in booking Truly Madly Deeply for your newborn’s photographs? Give us a call at the studio on (912) 642-8000, or complete the form on the Contact page to send us a message. Got questions about choosing a newborn photographer? Of have you worked with a newborn photographer in the past? Tell us about your experience by leaving a comment below.